19th of August. It was still Day 6. A moment stretched to infinity ended with a postcard written in two Spanish lines. And then a line in Chinese, its meaning forever a mystery to its recipient, in contrary to the layers of meaning intended by the writer himself. 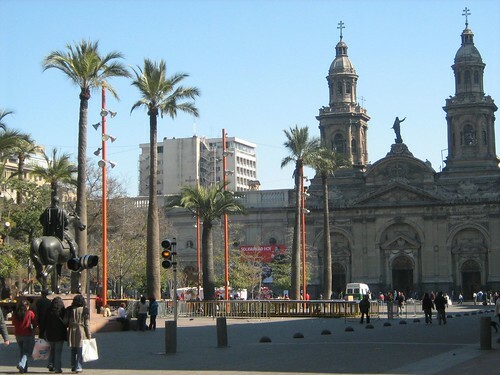 A smile of surprise and gratitude, a swift peck in the cheek, a warm embrace, traces of those left me as I left the hotel and embarked upon a solo tour to PLAZA DE ARMAS, the main square of Santiago. If I had only a day left in the city, I thought I would see as many sights of the city as I could, drinking its images, framing them into memory, just so I could lessen the remorse I would return with. 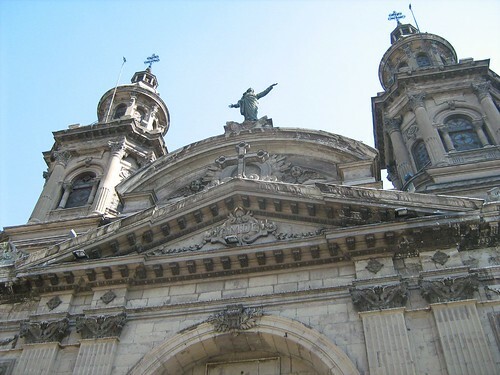 After a twenty minute ride in the commuter train, I emerged from the metro station of Plaza De Armas, confronted by the sight of a massive structure. 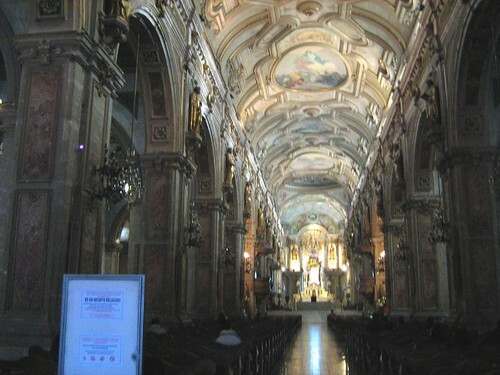 An ancient cathedral which I would know later as the Santiago Metropolitan Cathedral. It was a sunny Sunday afternoon, the place was crowded. Navigating carefully through the ocean of humanity at downtown Santiago, I looked at my surroundings with awe and wonder, like an explorer would when he had chanced upon a previously unexplored land. Aside from the brief visit at Pablo Neruda's house, I had spent the past five nights at the so-called 'richer areas' of the city, places tainted (or blessed, based on your perspective) by the touch of globalization, where most restaurants were fast food chains that can also be found in Malaysia, sprawling colossal shopping malls that inspire a strange sense of uncomfortable familiarity. What was its culture? Its tradition? 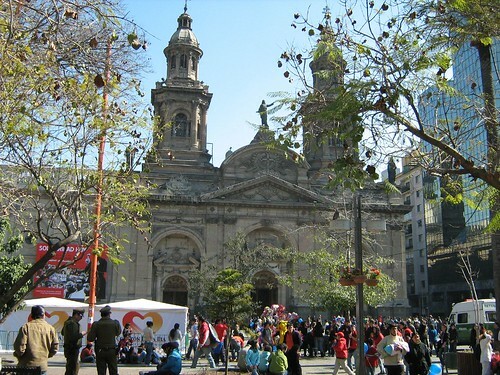 Aside from the language spoken, how different Santiago was compared to the many cities I had visited in the past? My questions were answered then. I walked into the cathedral and was briefly reminded of the St Mary's Cathedral I visited three years ago in Sydney. 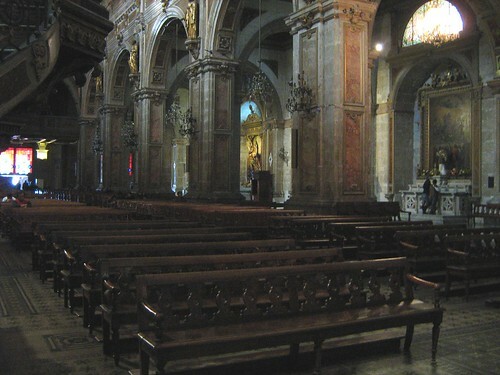 I was unsure whether I could take photos inside the cathedral until I saw a few other tourists busily snapping away in their cameras, so I did the same. The place was too dark, and the what I could came up with were quite blurry. 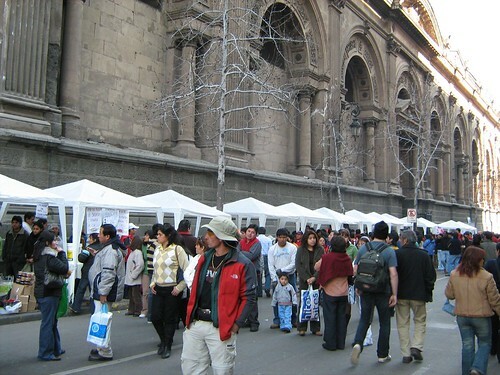 I exited the cathedral and saw rows and rows of food stalls lined up next to it, selling traditional (I presume) Chilean food. I didn't buy anything, a silly decision I would rue until this very day. I had wanted to find the Central Market, recommended by many I've met, including the hotel receptionists, for its great seafood, so all I wanted to do then was to find the Central Market and sample its fabled seafood. Before that, I went to the NATIONAL MUSEUM OF HISTORY, located merely opposite the cathedral. Everything was in Spanish, I was reluctant to pay extra for an English translator, so I merely wandered listlessly through the place, looking at ancient antiques that dated back from the Spanish colonization. Photo-taking was disallowed. After that, I started my search for the Central Market, but my efforts were in vain, my limited command of Spanish prevented me from finding the market. People merely stared blankly when I said 'CENTRAL MARKET', including a few policewomen I asked, the few who knew English had no idea where there was, I was mildly frustrated. The only thing I could get were two old Chilean-published music books of The Beatles and Elvis Presley, which I bought for dad because of their novelty value. Hours went by, I was already starving, thus I went to a pizzeria near the cathedral for food instead. I had something called the Chorrillana, combination of meat, fries, gravy, and other stuff. It was good, I think that was a Chilean dish. Picture of chorrillana used for illustrative purposes, it wasn't taken by me! 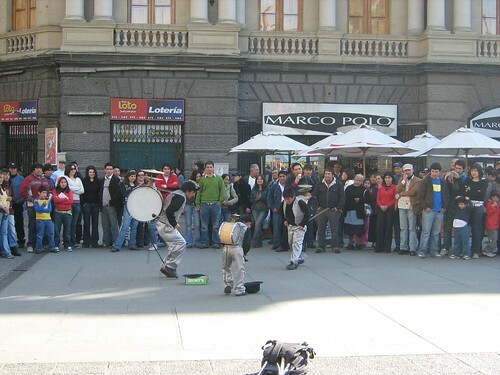 I made my way back to the metro station, and saw street performers performing, a trio of father and sons performing with drums. I continued walking. 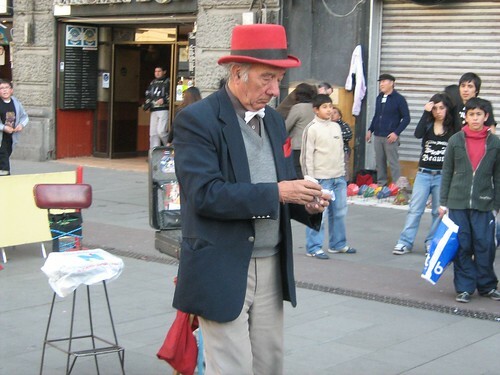 And saw a street magician performing magic tricks to a small group of children. I stood and watch for a while. It wasn't long before he had started attracting a large crowd too. I continued moving towards the station. 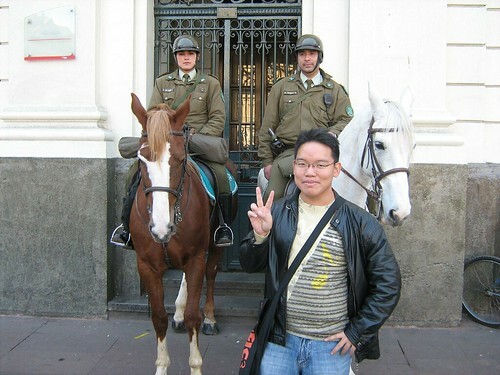 Of course, there would be a photo of myself as well, with two horse-riders whom I think MIGHT be the police officers of Santiago. Anyway, much more can be said about that day, like how I tried to go to the National Library, only to realize that it was closed, and then how I ended up randomly at a festival venue, stumbled into ANOTHER screening of Mike Ott's Analog Days, brought back to the hotel via bus. But I'll skim over the details. Slightly feverish, or maybe it was the heat I endured after the massive amounts of walking during the day, I fell asleep in my room in the evening, still unsure whether I could extend my stay in Chile, too weary to attend a night screening of Miriana's film, Drama Mex, which she produced and acted in. But before that, the staffers of the festival told me that a party would be held after midnight, a BIG party where members of the press would attend, I made a point that I would attend that, as long as I was in good enough shape. The hotel phone rang, waking me from my slumber. A travel agent friend of hers had helped me extend my stay in the country, canceling my flight on the 20th and changing it to the 23rd (flights to Sydney on the 21st and 22nd were full), but then she (or rather, my dad) reminded me that it was silly of me to fret over all these by myself when I was living in a 5-star hotel (I saw a plaque hanging at the walls saying that it's voted as one of Conde Nast Traveler's Top 500 hotels in the world!) and could have just asked the concierge to help me out. Already slightly rejuvenated, I decided to go to the party. Heading into the bus with a few festival staffers and guests, we headed towards our destination. Wait... a few festival staffers and guests? I looked around the bus again. How could it be??? Why were people skipping a so-called massive party where members of the press would attend??? Then I frowned in puzzlement. Turned out that it wasn't a party but a small gathering at a little pub. The festival staffer was either misinformed, or being sarcastic, or messing around with me, I had no idea. Not much of a drinker, and feeling a throbbing in my head thanks to the booms and dooms, I spotted Scott, the Canadian filmmaker I mentioned in Swifty In Chile (Part 1) (turned out that the 'famous Chilean actress' he pointed at during the opening party was REALLY a famous Chilean actress after all) standing at the corner, just as out-of-place as I was. I was hungry, I wanted something to eat, I asked whether he wanted to join me, he looked relieved, and we left the pub together. And both of us, two guys from two different sides of the planet walked down the empty streets of Santiago, our way illuminated only by distant streetlights and building lights, the night sky was pitch black, the coy moon and stars hiding behind the clouds. We spotted a pizzeria and went in. I ordered a pizza and we chatted, about films we liked, directors we admired, and what we thought of film festivals. All these years, I have wondered what film festivals were about. A chance for personal glory as a filmmaker? The opportunity to cement a place in cinema history by winning awards? To show your works to different kinds of audiences, not just regular moviegoers, but critics, people in the industry, fellow filmmakers, critics, academics, etc. and wait for their judgment? To see whether your reputation can spread further? Isn't this how many legendary filmmakers were born? In film festivals? "Yet attending this one, the first international film festival I've ever been to, I realize it's really about meeting people, forming networks, forging friendship, gaining contacts. It's not just about the screening of your own film, I guess." I said. Scott was more than twice my age, in fact, he was only a few years younger than my father, working as an instructor, having done numerous music videos, he had just made his first feature film. "Ultimately, we are all the same, united by films, tiny pieces of a large jigsaw puzzle." He said.